In Maine, A Common Language Connects French Canadians, African Immigrants Attendance at a local club for French speakers is at an all-time high. French Canadian natives, once ashamed of their heritage, are connecting with African immigrants over their shared language. 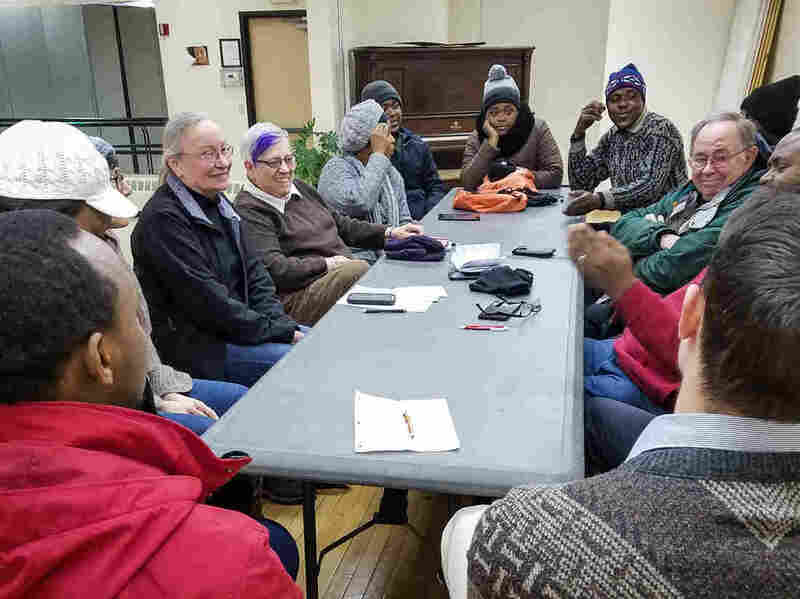 French clubs like this one have become de facto support groups for African immigrants in Lewiston, Maine. Of the 200 people who come to break bread together, most are Lewiston natives who are older and white. But these days, you'll also find black immigrants from Africa gathered around the luncheon tables. They're French speakers who want to improve their English and get to know their neighbors. That interest has also spurred creation of local French clubs that meet several times a week. It's the latest chapter in the story of French Canadian immigrants whose labor powered mill towns around New England but whose children and grandchildren felt the sting of discrimination. Many continued to be discouraged from speaking French until as late as the 1960s. Cecile Thornton of Lewiston says as a teenager, she felt embarrassed — even ashamed — of her French Canadian heritage. "A lot of the 'dumb Frenchmen' jokes were going around back then," she says. "And so I worked really hard actually to lose my Franco accent." Now, at 61 years old, she says it's a different story. In French club, Thornton and other Lewiston locals regularly swap stories with refugees and asylum seekers from Burundi, Rwanda and Congo. In French, Julie Mushiya of Kinshasa tells Thornton and others about health care in her country. And Thornton has become so close with the new Maine residents that in January, she attended a friend's wedding in Rwanda. The French clubs have also become de facto support groups. Many of the African immigrants are anxious about the climate for refugees in the U.S.
"We definitely do talk about the politics, and, you know, the Americans try to comfort us and tell us hopefully it's going to be OK," says Bright Lukusa, a 19-year-old asylum seeker from Congo. "And I choose to believe." There have always been pockets of French speakers in Maine. But Mary Rice-DeFosse, a French professor at Bates College, says the new immigrants have made that skill useful. "They're not fluent in English, and they need to speak French," she says. "And so these Franco-Americans who can speak French suddenly can find a public function for their French language." She says it's also a way of validating the French Canadians who made history here and welcoming a new wave of French speakers — this time, from Africa. Susan Sharon is the deputy news director with the NPR member Maine Public Radio. You can follow her @SusanSharon1.